Goleada supporters can set an Auto Skill-Up for every player. 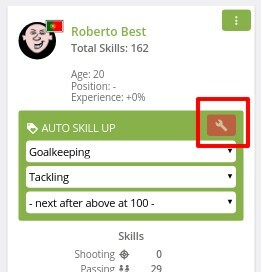 The managers can arrange player's training plan only once and the received skill-up points will be distributed automatically. Just click on "Build" red button, and select the sequence of skills that will grow. If the skill is at its highest limit (100), next skill will start to grow, and so on.